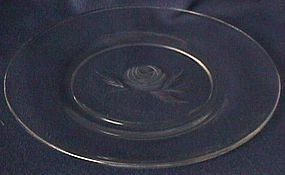 Anchor Hocking Glass Company made this pie plate. 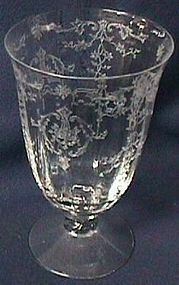 There are no chips or cracks in the glass. Thanks for looking. Viking Glass Company made this Madonna from 1980-81. There are no chips or cracks in the glass. Thanks for looking. Autumn Harvest was made from 1980-86. This set has the 471 1 pint, 472 1.5 pint, & 473 1 quart casserole. There are no chips or cracks in the glass. Thanks for looking. Autumn Harvest by Pyrex was made from 1980-86. This set has the 473 1 quart, 474 1.5 quart and the 475 2.5 quart casseroles. There are no chips or cracks in the glass. Thanks for looking. Woodland by Pyrex was made from 1978-83. This set has the 471 1 pint, 472 1.5 pint, & the 473 1 quart casseroles. There are no chips or cracks in the glass. Thanks for looking. Woodland by Pyrex was made from 1978-83. There are no chips or cracks in the glass. Thanks for looking. 1 Candy with 2 Bead Finial 400/59, $37.25, 1 Candy box and cover 7" shallow 400/259, $80.75, 5 Cocktail 3400, $13.50, These are in great shape. They are priced each. We have the 7" candy pictured. Click on enlargements to see a cake plate. Thanks for looking. 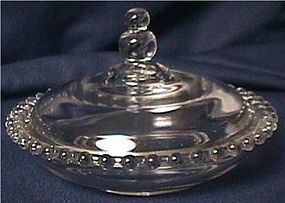 1 Urn 6.5", $71.25, Morgantown Glass Co. made Golf Ball from 1928-71. This is in great shape. We have a cordial pictured. 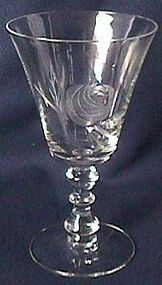 Click on enlargements to see the 6.5" urn, tumbler, sherbet, and a wine. Thanks for looking. 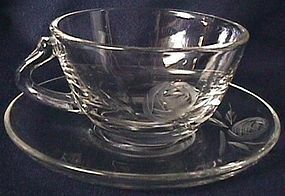 Fenton Glass Co. made these Silvercrest baskets from 1957-80. This is the 6.5" 7336SC handled basket. It's in great shape. Thanks for looking. 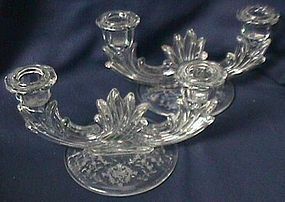 Morgantown Glass Co. made Crinkle from 1962-71. This tumbler is 4" and holds 3 oz. It's in great shape. Thanks for looking. 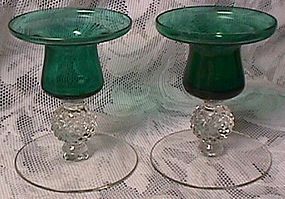 Fostoria Glass Co. made these duo Navarre candlestick pairs from 1936-70. They're in great shape. Thanks for looking. 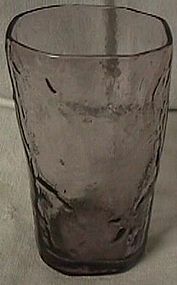 Fostoria Glass Co. made this Navarre 5 3/8" 10 oz tumbler from 1936-82. It's in great shape. Thanks for looking. 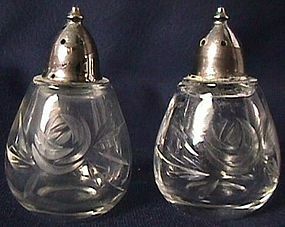 Fostoria Glass Co. made this Rose shaker pair from 1952-70. It's in great shape. Thanks for looking.